This is a 60 Amp, 4 Wire, Fused Heavy Duty, Type 3R. They can be used on circuits that are rated through 200K when protected by or used with Class R or J fuses. They feature quick make and break operation and visible blade construction. 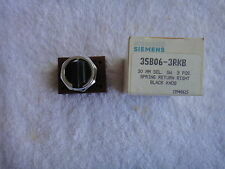 KXP1RJ Siemens modification kit Start-Stop pushbutton w/ 120v pilot light Condition is New. Shipped with USPS Priority Mail (1 to 3 business days). NEW IN BAG. View all photos. Inventory #. CAT# JF421. SERIES A. 30A, 4 POLE, 240V . (USES H,K OR R FUSES). VACU-BREAK CLAMPMATIC ACTION. NEW IN BOX. BOX MAY BE A LITTLE ROUGH DUE TO SHELF LIFE. Please examine pictures closely as they are part of my description. New In-Box ITE F321 ITE Enclosed Switch 30A 240V. We do not accept personal checks. We are here to help make your life easier. We are always buying! Item # : HF363R. Type 3R, Rainproof, 600V-600VDC. DISCONNECTOR / SELECTOR SWITCH. You will receive exactly what you see in the pictures, nothing more and nothing less. I opened this box to take photos. FUSIBLE "FUSES NOT INCLUDED". 30 AMP, 1 PHASE, 3 WIRE, 240 VOLT. This is a 30 Amp, 3 Pole, 600V max, Fused Receptable SW, Type 12 heavy duty safety switch. Manufacture date. A push-to-release button resets the switch quickly. Push-to-release button to reset switch quickly. Cable-operated actuator for use over long distances. Excluding Hawaii, and Alaska. Our goal is to provide excellent service. We do our best to describe and picture each item realistically. We check each item to verify condition. We are not happy until you are. 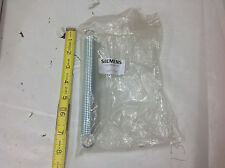 Siemens GNF322 60amp 240v non fused disconnect safety switch new! If we don’t have it, we can find it. SIRIUS POSITION SWITCH. Product designationstandard position switch. No personal collection. Let us know if our service could be better! We will make every attempt possible to resolve the issue if we made a mistake. SIEMENS, 52SX2AABK1, 2 POSITION A, CAM SHORT LEVER, MAINTAINED 1 NO, WHITE. We want each and every one of your buying experiences to be an easy and pleasant one. 2.12, Height (In.). 2.2, Width (In.). 3.15, For Use With Class 14 Starters, Separate Mounting Yes, Standards UL, CSA. What is your zip code?. We try to be as descriptive as possible for each item and represent each item in the pictures. If you have to get a hold of us, look us up on the net. New in Box. New Surplus. PO Boxes may also be more. Single cover interlock. 240V, single phase, 2 wire, non-fusible safety switch. Visible blade, double-break switch action. Safety Switch Type. Product Depth (in.). Product Width (in.). Product Height (in.). ED42B060 2P 60AMP. WITH PUSH TRIP. Lot of Six. Location: B140.